It's Not Work, It's Gardening! : Chuck! Guess who I saw today? I haven't seen this guy for a couple of months, and was wondering where he'd gone. 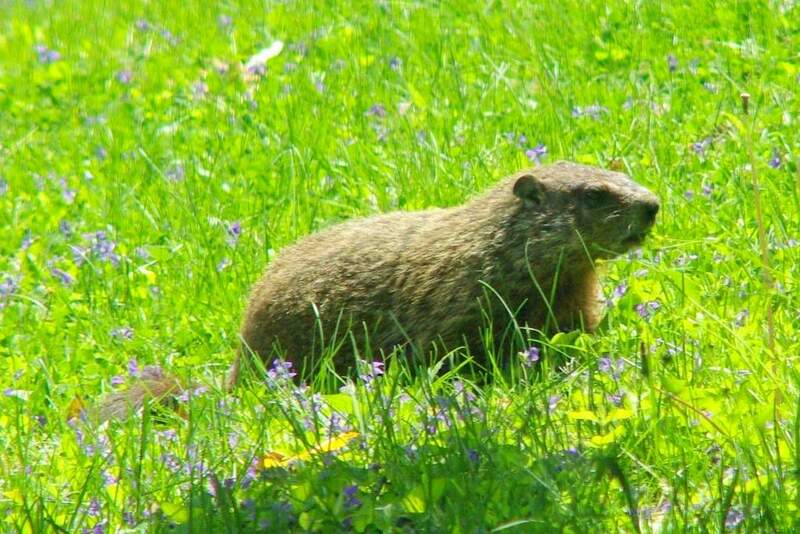 Today I saw him in the neighbor's yard (hehe), and watched to see if he had any interest in anything besides lawn weeds. Although I call him "him", I'm not really sure if this is a male or female. Considering that I haven't seen him for a couple of months, that could have been time spent with pups in the den, making him a her... but until I see the little tykes I'm just guessing. 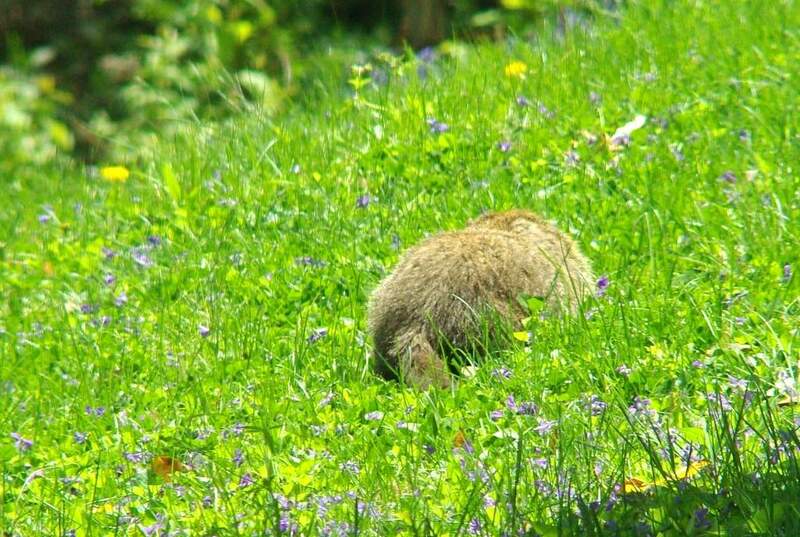 If you're not familiar with this animal, it's a woodchuck, or groundhog (Marmota monax). 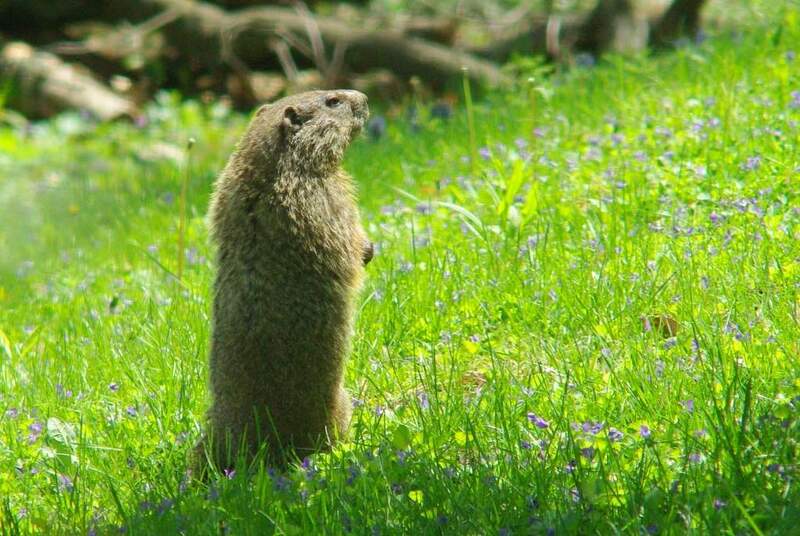 He's currently living somewhere behind my neighbor's yard, and I think he prefers the open ground over there. Hopefully I've been cramming enough plants into my yard to make it too "closed" for him. I heard there's a nice view somewhere around here. Is it over here? Oh, there it is! Lovely! That sure put a smile on my face. 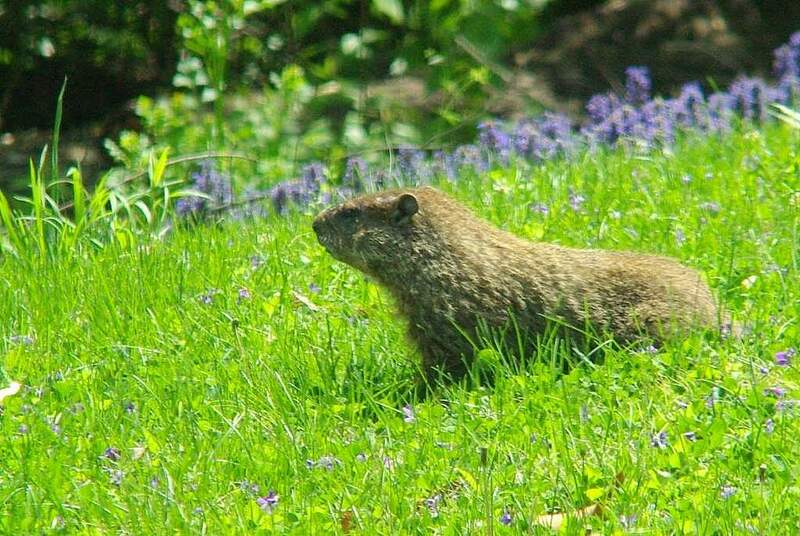 If woodchucks didn't have the capacity to do so much damage to my garden, I'd really enjoy having them around. The problem is they can quickly decimate a planting bed if they find something they like. They're not nibblers like rabbits. 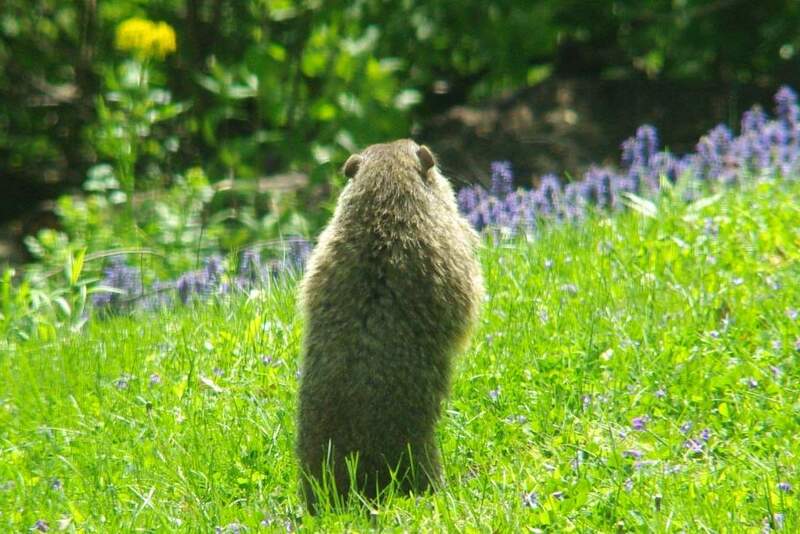 Raccoons and squirrels don't have posture like this! moving away from my garden, at least for a little while. I'm definitely going to be keeping an eye on this guy (or girl). 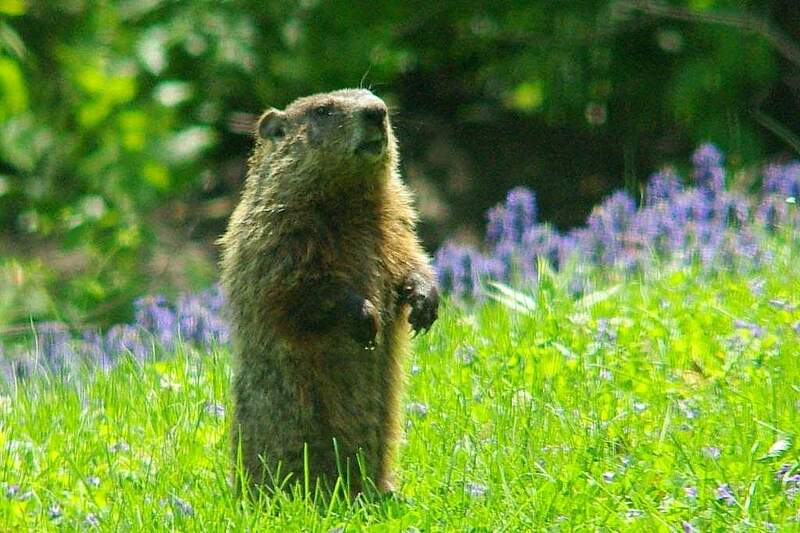 Do you think I should tell my neighbor that I saw the woodchuck go halfway up his deck stairs? Rabbits definitely don't do that. Although I couldn't see him at all times, I'm pretty sure he showed no interest in any of the raised beds or other plantings in my neighbor's yard. The young, tender "alternate lawn plants" (I've decided to stop calling them "weeds") are plenty for him right now. 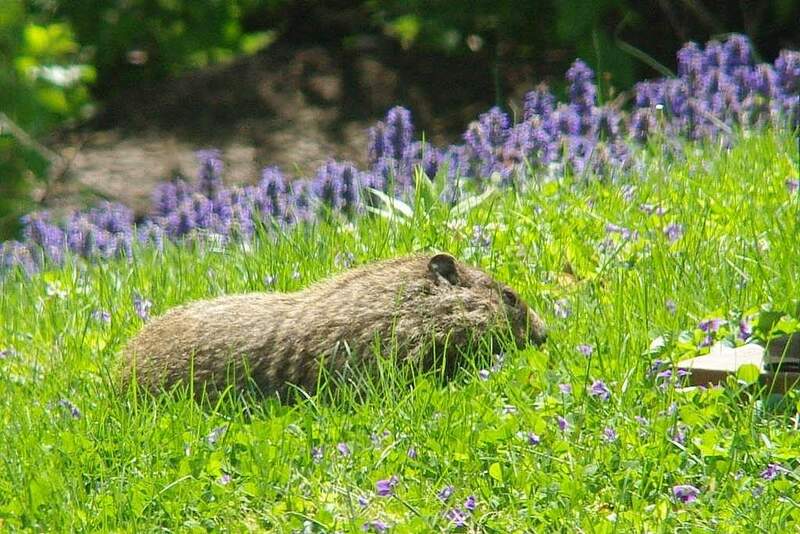 So this woodchuck gets to stay on the "cute but harmless" list. Let's hope he stays there for rest of the year, but that's probably wishful thinking. If only he could be trained to just eat the weeds. Then you could rent him out of lawn owners and make a fortune. Yes, I think you should tell your neighbor. Mud: I often think about that when I see a half-dozen rabbits in my yard at once. If only they could be trained or genetically engineered to eat specific plants and leave others alone... but surely something would go wrong and we'd live to regret it. You've got much more interesting critters than we do. We have rats, and rats with tails (=squirrels). I don't think you should tell your neighbour!! 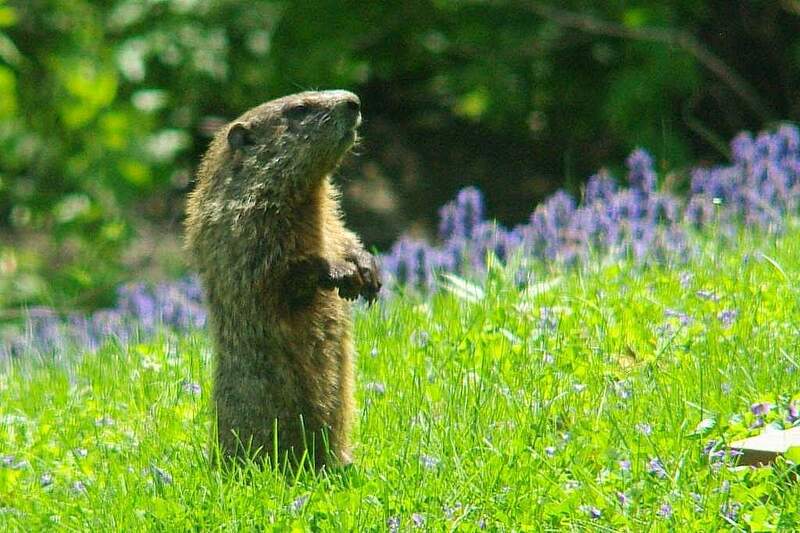 But I think "Chuck" is kinda cute - we don't have those here, just moles! Moles that cause all sorts of chaos in my garden. Oh! 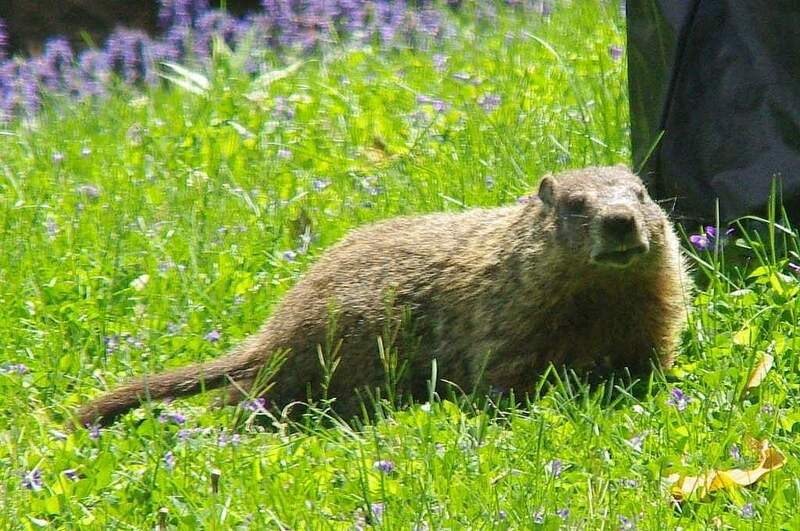 These ground hogs! Sigh. For a while they stayed away from yard because they were scared of the cats. Not any more. They have been killing everything in the back yard, dogs not withstanding. They even bit my dog, sending us all to the emergency vets! They have a nice underground home right under the deck and two exits in the yard. I like "alternative lawn plants." Really, I actually prefer a clover and violet covered lawn rather than a great big monoculture. And how did dandelions get such a bad rap? I love your photos of Chuck amongst the weeds or lawn. Great composition. I don't mind some garden damage so that I could take some cute photos like that. Chuck is a cutie, I guess until some garden destruction occurs. Hope Chuck is a boy too. Wonderful photo. He look cute...and the flowers in the background are beautiful. Cute little fella...looked like he was making a tough decision, whether to go to your side or your neighbour's. I bet the beautiful blue flowers enticed him in the end! One happy man smiling broadly!